Will Bed Bath & Beyond Come Back From the Dead, or Is Macy's the Way to Go? After seeing its shares plummet, Bed Bath & Beyond could be a great bargain! However, is it possible that Macy's makes for a better play for the Foolish investor? After Bed Bath & Beyond (NASDAQ:BBBY) reported revenue and earnings results that fell shy of analyst expectations on June 25, shares fell 7% the next day to close at $56.70. With shares of the domestic merchandise retailer trading near a new 52-week low, some investors might think that now's the time to get in. However, is it more likely than not that the real action for the Foolish investor can be found in Macy's (NYSE:M) instead? For the quarter, Bed Bath & Beyond reported revenue of $2.66 billion. Although this represents a modest 2% gain over the $2.61 billion management reported last year, its results came in short compared to the $2.69 billion analysts anticipated. In its press release, the company attributed its rising sales to a 1.5% increase in store count to 1,500 locations from the 1,478 reported for the same quarter last year. This was complemented by a disappointing 0.4% improvement in comparable-store sales. 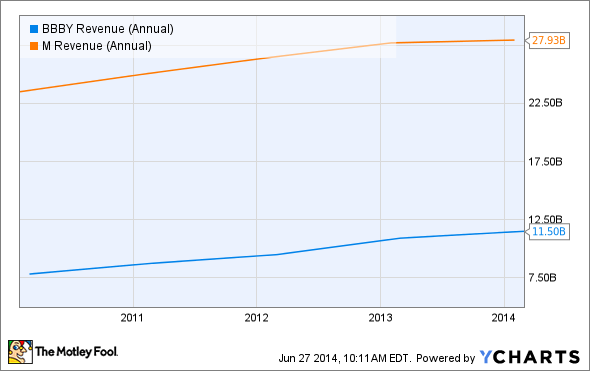 From a profitability standpoint, Bed Bath & Beyond's numbers were even worse. For the quarter, management reported earnings per share of $0.93, matching last year's performance but missing the $0.95 Mr. Market hoped to see. Despite benefiting from higher revenue, the retailer's bottom line was hit by rising costs, primarily in its cost of goods sold, which rose from 60.5% of sales to 61.2%, and its selling, general, and administrative expenses, which increased from 27.2% of sales to 27.5%. This was, however, offset by a 7% reduction in share count as the company bought back shares. But how does the company fare against the competition? 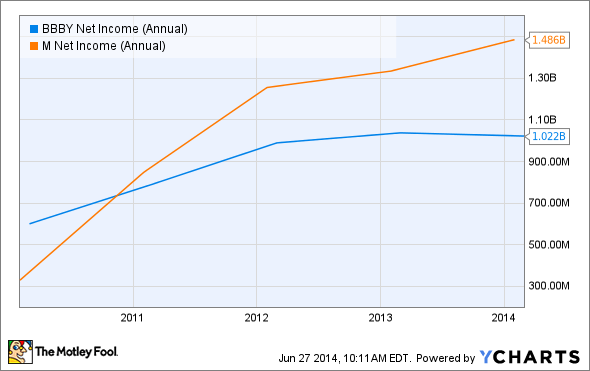 Over the past five years, Bed Bath & Beyond has been a pretty decent growth story. Between 2009 and 2013, the retailer saw its revenue jump 47% from $7.8 billion to $11.5 billion, while net income soared 70% from $600 million to $1 billion. The increase in revenue has been, for the most part, chalked up to a 36% rise in store count from 1,100 locations in 2009 to 1,496 by the end of its 2013 fiscal year. The company's net income performance has been mostly due to its increased sales but can also be attributed to lower costs in its selling, general, and administrative expenses in relation to revenue. While Bed Bath & Beyond's results have been impressive over the past five years, Macy's hasn't been anything to scoff at. Between 2009 and 2013, Macy's saw its revenue shoot up 19% from $23.5 billion to $27.9 billion. Although Macy's store count decreased by 0.7% from 847 locations to 841 during this period, its aggregate comparable-store sales growth of 10% (12% including its store-within-a-store concepts) and improving e-commerce sales helped to pick up the slack. From a revenue standpoint, Macy's did well but nowhere near as well as Bed Bath & Beyond. But from a profit perspective, the company's performance put its rival's growth to shame. Between 2009 and 2013, Macy's saw its net income skyrocket 352% from $329 million to $1.5 billion. Some of this increase can be chalked up to the retailer's higher sales, but bigger contributors appear to be the 20% reduction in debt the company reported and the drop in its selling, general, and administrative expenses from 34.3% of sales to 30.2%. Based on the data provided, Mr. Market was displeased with Bed Bath & Beyond's performance this quarter, but there is some upside. On top of seeing strong long-term growth, the retailer is still showing signs that sales are continuing to increase. This suggests that the business is fundamentally sound, but the drop in profits (only saved by a decreased share count) is something Foolish investors need to monitor if they decide to pick up its shares. As an alternative, Macy's may be a strong play. Admittedly, the retailer's revenue growth hasn't been as rapid as its rival's, but its jump in profitability is hard to pass up.